You are here: Home / TIPS & TRICKS / Kitchen Aid Food Grinder Attachment – How it works? Kitchen Aid Food Grinder Attachment – How it works? 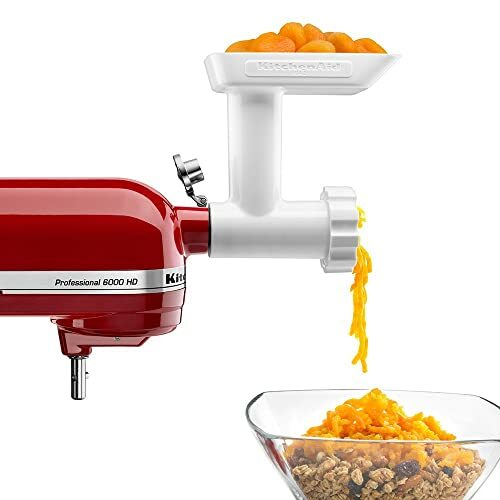 Today, we’ll learn more about the Kitchen Aid Food Grinder Attachment and how it works. This attachment shouldn’t be too difficult to assemble. Insert the worm in the attachment’s body (it’s the biggest piece in the set), place the cutting knife on the square shank and add the cutting plate next (choose from two types of cutting plates – coarse or fine – depending on the consistency you want for your meat). The cutting plate should fit perfectly on the slot, push it gently to lock it in place. Get the ring and attach it over the cutting plate. Twist it to secure it. There’s a wrench provided in the kit that you can use to remove the ring. It should only be used when taking the ring off and not when attaching it. A food pusher is also included. Use this to push the meat into the tube. Once you have assembled your food grinder attachment, you are now ready to attach it on the top of your Kitchen Aid mixer. Cut the meat into small pieces. Secure the head of the attachment to the mixer. Turn on the mixer to your desired setting. Four should be a great speed for grinding. Place your cubed meats on the meat tray and use your stomper to push the meat in the tube. Ground meat should start coming out of the attachment so there should be a bowl catching the meat. It’s ideal to use very cold meat if you want to get the best texture. Try refrigerating or freezing your meat first before grinding. You can also use the grinder to grind vegetables. Try cutting up your veggies (scallions should be a good ingredient to mix with your meat) and put it on the meat try. Ground it using the fine plate. It will produce a paste-like consistency. Cabbage can be chopped into strips and ground in the machine. It should produce a coarse consistency. Fruits like apples can go in the grinder too but the fine plate would make it runny and juicy. Carrots can be ground up using the coarse plate. You shouldn’t have a hard time grinding other types of meat like beef. Like the pork, cut the beef into large chunks before putting them on the meat tray. In just a few minutes, you’ll get fresh ground meat. All in all, Kitchen Aid food grinder attachment does a fairly good job grinding vegetables. However, it produces better texture on harder vegetables than the softer ones. This meat grinder attachment is highly recommended for people who are looking for ways to freshly grind their meat without spending a lot of money. The kitchen is made of… Bowls!